Amazing range of colour: red, pink, purple white and bicolour. Double and Single. In mid-April, repot using an ericaceous compost. 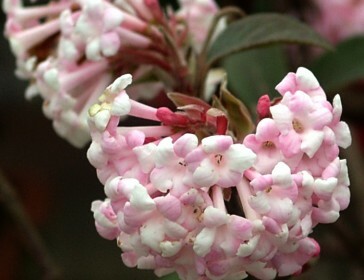 Plants can be stood outdoors in a cool, shady site for the summer but keep moist. Bring indoors before frosty weather. The favourite Christmas Houseplant usually red but they now come in pink white and marbelled too. Glendoick only sell Scottish grown Poinsettia as they hate travelling. 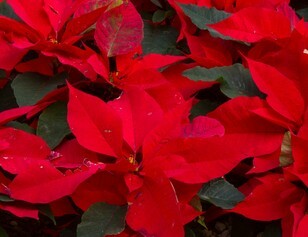 Supermarket poinsettias usually die quickly as they have been trucked from round Europe and then they dont last. They need bright, but filtered light, away from strong sun and they hate draughts. Bes with a minimum temperature of 13-15°C (55-59°F) but they can take cool temperatures as long as it is not draughty or fluctuating. Be careful when transporting poinsettias from the shop to your home in the winter, as the cold outdoor temperatures can damage the foliage. If cold or windy ask for wrap for the plant. Do not overwater and keep water off the foliage but mist to keep humidity up. Very hard to get back into flower so usually thrown away after Christmas. 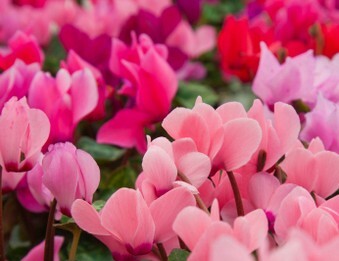 Cyclamen should bloom for several months and can flower again in future years. 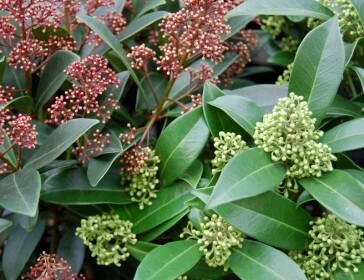 Select a plant with plenty of buds showing underneath the foliage. Avoid plants with drooping or yellow leaves, as they have often been overwatered. Occasional drying out of the compost is less harmful than overwatering. Best watered from below using a saucer. Keep foliage and flowers dry. 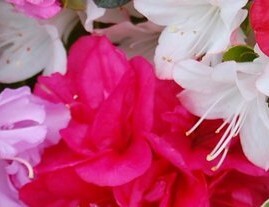 Remove spent flowers by twisting the stems. After flowering, continue careful watering and feeding until leaves yellow, then reduce watering as the plant becomes dormant for the summer. As new growth appears, replace the top few centimetres (half an inch) of compost in the container with fresh compost and resume regular watering. 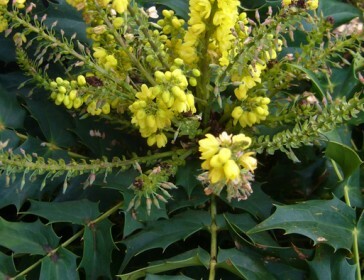 Mahonias are striking statuesque shrubs with evergreen holly-like leaves with sharply toothed leaves. 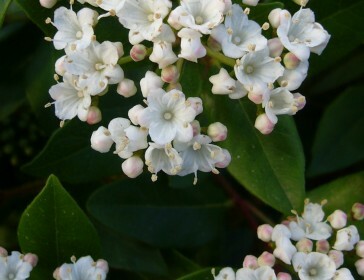 They have yellow, slightly fragrant flowers in upright racemes, November- March. Young leaves flushed reddish. 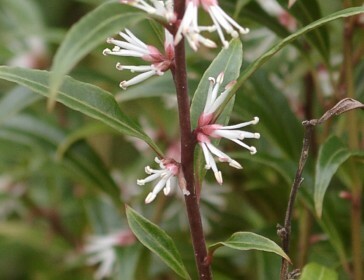 Useful for its evergreen winter foliage, winter flowers and will grow in quite dry conditions. 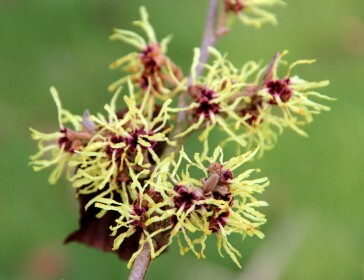 The garden need not be empty of colour and scent at this time of year: Many winter flowering shrubs have small sweetly scented flowers: why not create a small scented winter garden using Viburnum, Hamamelis, Sarcococca and contrast them with the red winter stems of dogwood. 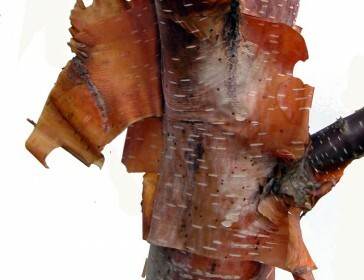 Many plants show off their coloured stems and bark at this time of year. For maximum impact, plant the shrubs in groups and the trees where their bark can be seen and appreciated: against a contrasting background: pale bark shows up well against a dark background for example and vice versa. 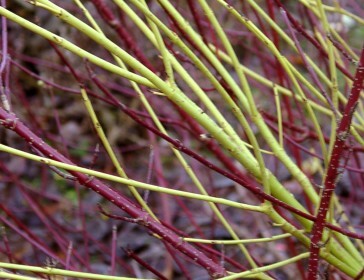 Cornus (dogwood) and Salix (willow) are best pruned each year, almost to ground level in Spring, to ensure good crop of the bright coloured stems for winter. You can also cut Eucalyptus down each year or two for the same effect and to keep the foliage juvenile. Salix alba var. vitellina ‘Britzensis’ rusty orange stems. Ht 2m or more. Looking for Gift Ideas for Gardeners?